I have a few minutes, so I thought I’d tell you a little more about the search for spare parts that’s been going on in my life. Specifically, something I neglected to mention in my last post. See, I hate something that’s broken, doesn’t work, or is just sitting there collecting dust for the “one day” that I’ll get around to it. Since I’ve been home most of the time, I notice them, and in the last month or so, I’ve been fixing them, too. The last time I was home all the time, I figured out how to clean out the peephole in my door so that I could see out of it. The manual doorbell doesn’t ring anymore, but I can indeed see who’s there. Then I went to Neighbor R’s place and did the same for her, so now she can see outside too. I do have a sewing machine that needs fixing, but I’ll get to that later. Ditto for the leaky bathtub faucet, which numerous YouTube videos are dedicated. I’m getting ahead of myself. My Dad was a “fix-it guy,” and often me and my brothers were conscripted to be “helpers.” When I was about 7 or 8, I bragged to someone or other that my dad could fix the air conditioning and everything else; fortunately, he was not “volunteered” for anything from my commentary. We weren’t that much help, but eventually I started picking up a few things. I’m no flame-haired “Tim the Tool Man Taylor,” but from time to time I’ve learned to fix small things and didn’t have to call out for repair (from either the former landlord or a service company.) Mike Rowe, the “Dirty Jobs” guy, might even be a bit impressed. Neighbor K turned me on to looking it up on YouTube, since she’s fixed a few of her own things that way. Why didn’t I think of YouTube before? So let me tell you how this all got started. . . . Some time ago, my air conditioner started draining water inside. The new landlord couldn’t be bothered, and this went on for many months, nearly flooding the place at one point. I started putting towels in that space below the unit, and because the water stunk, this required the towels to be washed. That was fine until. . . . The washer stopped spinning. That means that everything had to be wrung out by hand. This started a repetitive motion injury that my left elbow is still healing from, but it’s getting better. Laundry took a long time. Months of stress later, I decided, stuff it, I’m going to fix the problems myself. I chanted to have them done by a certain time frame (2 weeks, I think) and hot dawg, it was! I did it! First, the AC. After some research on YouTube, I went to Wal-Mart and purchased a little wet-dry Shop Vac that worked perfectly and sucked all the gunk out of not only the drain pipe but the drip tray, which was also clogged. I poured a hot bleach/water mixture into the pipe, and then beyond the coils into the drip tray. That was over a month ago. . .how dry I am!! At no time did the prior landlord ever suggest putting bleach and water down there twice a year. I would have been happy to take care of it, and it would have saved a lot of money and aggravation. But it’s done, and I hope to never have that happen again. Then through some correspondence on our local Nextdoor.com, I not only got the name of a reliable and honest appliance guy, but also a YouTube video on how to replace the motor coupling in the washing machine. I did, but still ended up calling the guy, who showed me that I’d failed to reconnect the wire between the carburetor and the motor. Once he did that, I was back in business. He did charge me $40 for the call, but that was just fine–total cost was under $100. And I’m washing all my clothes happily again. In my last post, I mentioned the replaced glass plate and rotating ring assembly in my 11 year old Sunbeam microwave that had long ago gone by the wayside. With the model number from the back, and a few online clicks (on the iPhone, no less) I had it in about 10 days. Sometimes I just look into the microwave and gaze at it. . .I’m so happy to see it looking and working perfectly normal again. 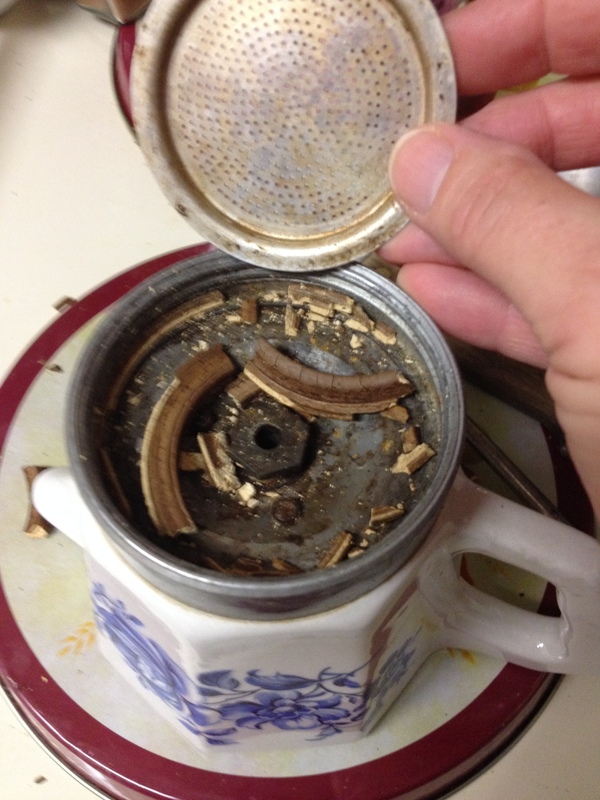 Next was finding the the replacement part for a discontinued but functional coffee grinder on eBay. Additionally, when the former landlord installed a new dishwasher, some external plastic parts (like the handle across the top of the door) were badly cracked. Eventually they fell off, and I’m sure that when I move out of this place, the new landlord would call that “damage,” and charge me for it. Nope–I have the replacement part for that too, I just have to talk to the GER about how to un-install the dishwasher, or call my appliance guy again. I’ll get on YouTube and research it. I can’t cut the power to the whole place, then I can’t see what I’m doing! Stuff like that can be found online at Easy Appliance Parts. A week later, they were here. Just haven’t replaced them yet. So, I went to the Woodlands on Monday, and had to go back today (although I headed home after a bite at Starbucks.) When I go to Sur la Table, I like to buzz through and just look at stuff. New linens. Pure white dishes (Williams-Sonoma has their own line, too.) Spatulas of all kinds in huge crocks. And then there’s the coffee area, with Bodum French press pots and Bialetti stove-top espresso pots in different sizes and styles. This time, something caught my eye. Now, I’ve bought replacement glass beakers for the Bodum pots that I have (especially the 2 cup, which I have broken twice), so I knew I could either get them there or order them online from Bodum (along with filter assembly parts as well.) But I never thought about Bialetti. Because the bed is where I have the most space to take these pictures. Where in the world would I get something like this? Where else? That gasket used to be white. It sat on a shelf with some pictures and other antique-y things, until I realized on Monday. . .I could get replacement parts! Carpentry expert Norm Abrams wrote a book called Measure Twice, Cut Once. That’s also a catch phrase with carpenters (another thing my dad used to do; I sew like he used to do carpentry.) Hint: not just for carpenters, OK? Unfortunately, I didn’t take any measurements, and just presumed that what I bought would fit. And it didn’t. . .this one turns out to be a 4-cup, not a 3-cup. But I’m getting ahead of myself. I always wondered what was in there. Now I know. And that’s when I discovered that not only did the new filter plate not fit, the gaskets wouldn’t be coaxed into place, either. 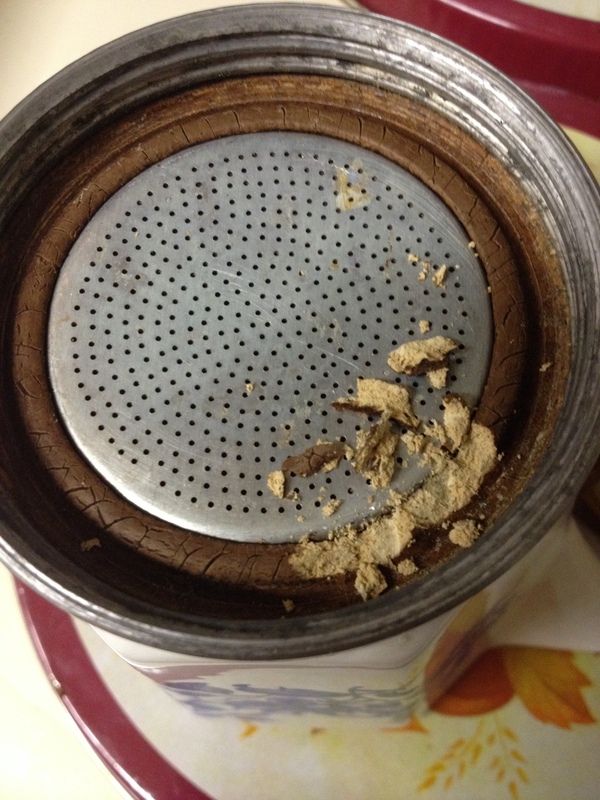 So I did what I frequently do in these situations: pulled out a Brillo and started cleaning the heck out of it. Ever seen one of these before? I’ve looked in a few place but haven’t found any history on the Flory Express, but I did find a similar model listed on eBay. For nearly $55. 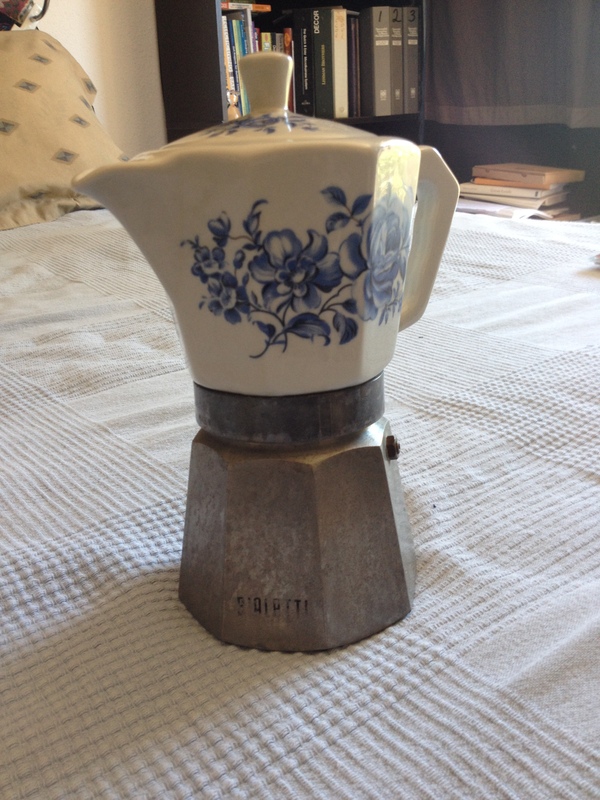 Not bad for an old Italian coffee pot, is it? Pretty nice, and in good condition. Someone else has one just like it for sale from Australia for $65. Makes me think about it. . .but it would be interesting to see who buys one of them. I didn’t see any bids on either one. In my little neck of the woods, though, I got on the Bialetti website, took measurements as instructed, and I’ll soon have a new funnel basket and two packs of the gasket and filter plate. I hope they fit. If they do, I’ll be makin’ me some stove top Cafe Americano. . .if not, I give up. I’ll add it to the eBay fray. Of course, I have my receipt from Sur la Table, and will return the gasket packs when I go back to see Dr. Davis in the next few weeks after all the labs come in. They may only take back the unopened pack, but if they offer a store credit, I’ll be getting a bottle of olive oil and maybe a spatula or something. I’ve scrubbed the metal parts as best I can, going through two Brillo pads. 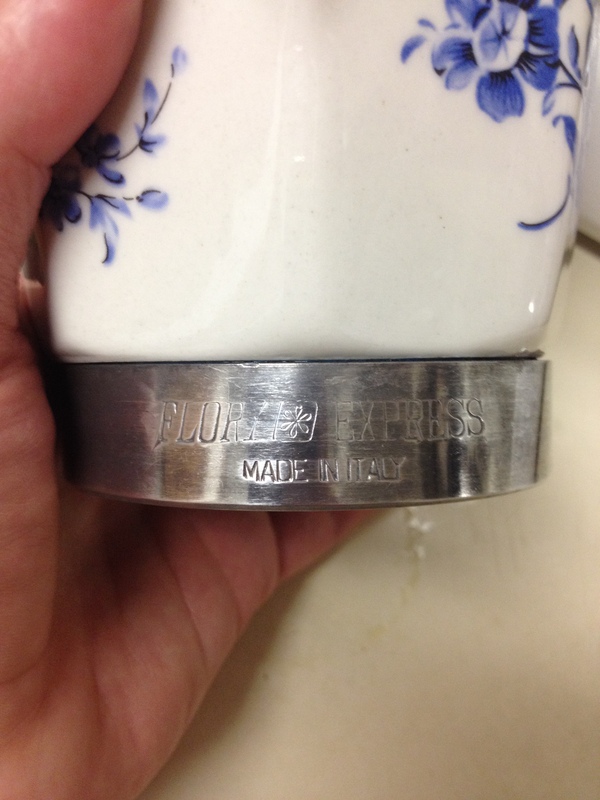 The Bialetti name is barely visible on mine, but it’s there, and also has some inscriptions on the bottom. When the parts arrive I’ll be boiling water and vinegar on the inside, and may check out some other cleaning options. I found a few here, but so far, it’s still grungy looking on the inside; I may be stuck with that. I did try pouring boiling vinegar water in it earlier, but nothing happened. The outside is still a bit funky, too, but since HRH Queen Elizabeth isn’t coming for coffee, nor Martha Stewart, I think I’ll be OK with it. I plan to boil water in it once or twice before I actually attempt using it for real coffee. You can find these neat little pots at the Bialetti website, Amazon.com, Cost Plus World Market, Williams-Sonoma, Bed, Bath and Beyond, and many other retailers. 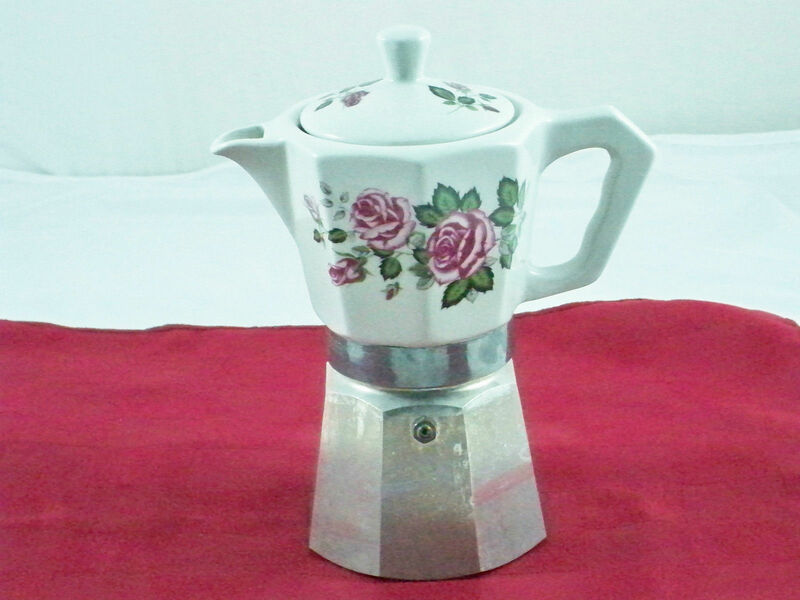 You can also read more about the history of the Bialetti stovetop espresso pot and company here. Wikipedia also has an entry with a little more info. So, if you’ve always wanted to try one of these, they’re not difficult or terribly expensive, and I’ve known quite a few devotees to the Bialetti. Me, I just wanted to fix something, so I’ll let you know what happens when I get the parts. Maybe I’ll make the GER some decaf espresso and bowl him over. Sometimes it doesn’t take much. The GER is taking me on a “foodie adventure” next week, so I’ll let you know how that goes, too. Thank you for this. How did the gasket work out? I bought one of these in Italy when I was in college. Now I’m 56 and that gasket is…old! Did the Bialetti fit? 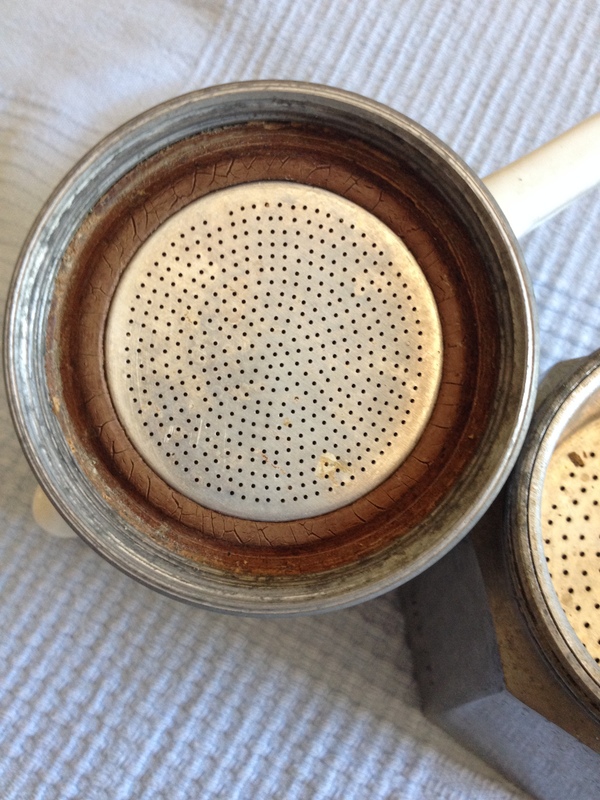 Finally, yes–it’s a 6-cup model, and it works exactly as it should. eBay, Etsy would be my guesses to start. 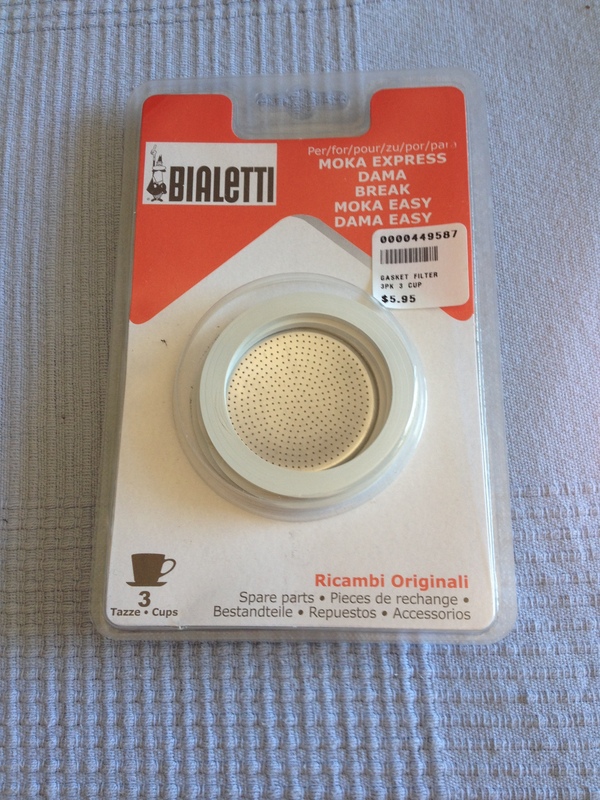 You could also contact Bialetti directly and see if they can help you. Other than that, I’m not sure.